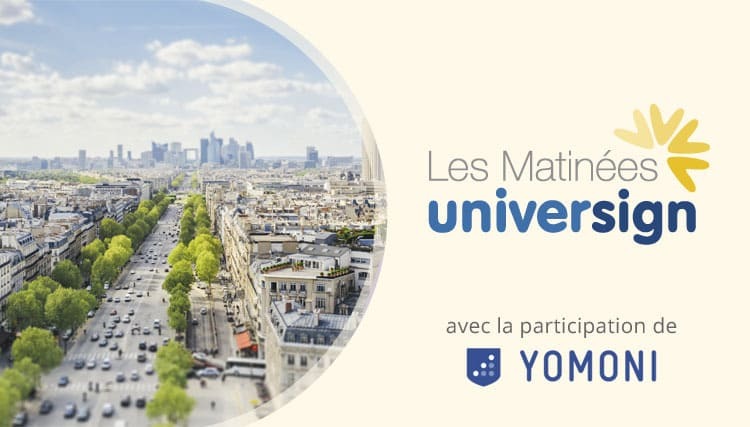 Participate in the first edition of "Matinées Universign"
Universign is kicking off his “Matinés Universign”, a recurring thematic meeting with feedback from our customers. On the occasion of his first edition, on Thursday June 9, 2016, Universign gives the floor to the company Yomoni, the 1st digital management company in France. The “Banking, Insurance and Financial Services” sector is undergoing a period of change marked by sophisticated regulations and surfing the wave of new uses such as self-quantification, economic uberization or disintermediation. New innovative players have fully integrated this digital shift into their business model to facilitate access and reduce the costs of financial services. The purpose of this event is to discuss the new levers of digital transformation in the “Banking, Insurance & Financial Services” sector. Based on Yomoni’s testimony and Universign’s best practices, learn how the electronic signature is by the side of the sector to meet the security requirements of signature for different types of contract. Our conference “Les Matinées Universign : the electronic signature, an indispensable element for the digitization of financial services – Témoignage Yomoni”, will take place on Thursday 9 June 2016 from 08:30 to 11:30 at the Sofitel Paris Arc de Triomphe Paris 8th . – What is the state of the art of electronic signature in the world of financial services ? – What are the new security and online identity verification issues for the banking and insurance industry ? – What are the prospects for the new eIDAS regulation, which will come into force on 1 July 2016 ? – What is the view of regulators of the sector in France (AMF, ACPR) and Europe (ESMA) ? – What is the position of the alternative actors? What is the strategy of the traditional financial entities facing this new wave ? – What is new for financial services players ? – Electronic signature, digital identity and security: the new challenges. 11:00 am > Foresight : the digital trust tomorrow ?